Love to sing? Then we have exciting news! You’re invited to come join the Tron Community Choir. Sessions take place on Mondays, 6.30pm - 8.30pm. As one, they’ve belted choons from Arctic Monkeys to Hall & Oates to Taylor Swift… and performed at events including Pride and T in the Park. There are no auditions, anyone is welcome, zero experience required. Membership includes Tron discounts, and is just £8.50 a month with your first session on us. If you’re interested in giving your pipes a weekly workout simply call Tron Theatre box office on 0141 552 4267 and they’ll get you signed up today! The Tron Community Choir are available for gigs and events. Sorry, but we have no upcoming events for Tron Community Choir. 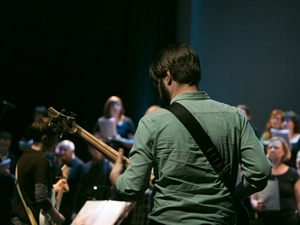 If you know of an event taking place at Tron Community Choir or anywhere else in Glasgow tell us about it and we'll list it on the website, for free!